Starting an eCommerce store is difficult. With so many moving parts, it’s hard to know what should take precedence, what you need to work on and what will ultimately give you the biggest return on investment. By the end of this epic blog post, you’ll have all the tools, resources and skills you need to ensure your eCommerce strategy is ready to start generating serious profit. From choosing products and platforms, pricing your products and choosing the right marketing tools for you, this guide will take you step-by-step to ensure you dominate the world of eCommerce. For each point, feel free to click through our links to read further about specific topics in detail!. Before you begin to sell online, you need to choose your products. Now when it comes to picking what products you want to sell, you have a number of options. Will you go with products you already use yourself? Will you use research to see which products are top sellers? Will you manufacturer the products yourself? Will you buy your products directly from a supplier? One of the greatest benefits of choosing an industry you’re familiar with is the principle that if you’re already a customer, you’re already ahead of the curve when it comes to pricing and marketing your products. In these scenarios, you’ll usually find a supplier who sells the items you’re looking for and make an order for them. Please note, in most cases, you’ll have to have space to house your inventory. Each year, countless blog articles pop up that talk about the top niches that are currently trending right now. In many cases, you can follow these articles and find the best selling products. Or you can use Google trends and conduct your own research to see what products have been up and coming in recent years. For example, you can see that “nootropics” has had a healthy increase in interest over the years. Therefore, if you were looking to find a product you could sell, this could be an avenue you explore. For many eCommerce retailers, their aim is not to just resell products that already exist, but to design and manufacturer their own original ideas. Although this can be lucrative in the sense that you’re selling original products not sold anywhere else, you have to factor in the cost to do so. Thomas is a great online directory that can point you in the direction of a supplier. Talk with as many as possible to try and find one that you feel you’ll work well with and has decent fees. Often manufacturers will need you to order your first (and subsequent) orders in bulk. This means you need a decent amount of capital behind you before you get going. You also run the risk of not being able to sell the products after you’ve had them created. For new eCommerce owners with little to no budget, dropshipping is an easy way in. Dropshipping is simple. You find a site like Alibaba or Aliexpress and pick the products you want to sell. You then list those products on your website, writing your own product descriptions, or even, if you’re feeling particularly lazy, you copy and paste the ones listed on the site. Here you can see that these headphones sell to you (as an eCommerce owner) for $4.90-$5.40 a piece. You then have complete freedom as to how much you resell them for. When you receive an order, the site you buy it from handles the delivery and returns. The good thing about dropshipping is the fact that there’s no inventory. You don’t have to buy your products in bulk. You only order an item when you’re ready to send it to a customer. However, do keep in mind that there are hundreds, if not thousands of dropshippers and the likelihood is someone else will be selling the exact same products as you. So if this is an avenue you’d like to go down, be sure to make sure you’ve found a way to differentiate your store from all the rest. Once you’ve decided on your products, it’s time to choose a platform. There is a range of out-of-the-box solutions that you can use, or you can choose to have a bespoke system created specifically for your store. If you’re just starting out with e-Commerce, we recommend sticking to one of the easier to use solutions. This will not only save you money but save you time to focus on other important tasks. Shopify is a great solution for those just starting out in the world of eCommerce. One of the greatest things about it is the free trial. Although Shopify is a paid software, they let you run a store just as you would normally, for free to see how you get started. In many cases, people use this free period to make enough sales to cover the cost of the program for the rest of the year. That way you can focus your budget on other important tasks like marketing. Magento is an open source framework and arguably harder to understand and get to grasps with unless you have some development knowledge. If you have a solid understanding of PHP, you’ll do well to develop a Magento store. However, if your development knowledge is limited, it might be better to opt for an out of the box solution like Shopify. For some eCommerce owners, they don’t want to deal with the hassle of building and maintaining their own online store, and so instead, they capitalize on the audience already present on marketplaces and sell their items there. Marketplaces like Amazon, eBay or Etsy are great if you already know there is an audience looking for your item. Be warned though, you’re unlikely to be the only seller selling on the marketplace and so competition is fierce. However, despite this, you can do extremely well selling on marketplaces, especially if you’re selling handmade goods. Etsy, for example, has a wide range of sellers who sell bespoke (often handmade) items and sellers are able to charge a premium because people who use Etsy appreciate the time taken to create the items. Despite the fierce competition, marketplaces are great as they mean you no longer need to worry about trying to get your site to rank on the first pages of Google. Amazon, for example, already has the traffic coming to their site. All you need to do is optimize your listing to ensure people buy from you and not the other sellers selling the same thing. When you’ve chosen your products, and the platform(s) you’ll use to sell, you’re almost ready to go! But the next thing you need to do is ensure that your products are priced properly. There is a range of different ways you can price your products, as well as a range of different pricing strategies you can implement to increase the number of sales you make per day/week/month. There is a range of different pricing strategies you can use within eCommerce to encourage people to make a purchase. Some of them are psychological in the sense that they make the shopper feel as though they’re paying less for the item than they actually are. Take the power of 9 example. When you see the price $3.99 it seems so much cheaper than $4.00, even though the difference is only $0.01. But because of the perceived value gain, people are more likely to buy a product when it’s $3.99 than when it’s $4.00. Other pricing strategies are less about psychology and more about adding value. If you can make a customer think: “well, I’d be stupid not to buy that other thing,” you’re going to increase the number of sales. That’s a similar thing you can do in eCommerce. This notion is known as upselling and cross-selling. As the saying goes: “you get what you pay for,” but the truth is, people, love a discount. They love the feeling of knowing that they’ve saved money on the item they’ve bought. That’s why a good pricing strategy you can adopt is to add a discount to some of your products. Note. It’s probably not a good idea to add discounts to every product you sell. This is because it comes across as though your site is a scam shop. People love a discount, but they also want to be able to trust you. You can use discounts in a number of ways. You might have a flash sale where for one day only you can get X amount off your order. Or perhaps you have an entire section of your eCommerce website dedicated to items in the sale to entice bargain shoppers to browse. Another method you could try to encourage people to buy is to offer free shipping. A consumer could add $300 worth of items to their basket, but if they see $45 shipping costs, they’re likely to look somewhere else to buy the item from. That’s why programs like Amazon prime do so well. You have the illusion of free shipping, even though you’re actually paying a monthly or yearly fee to do so. Offering free shipping is one way to reduce friction. 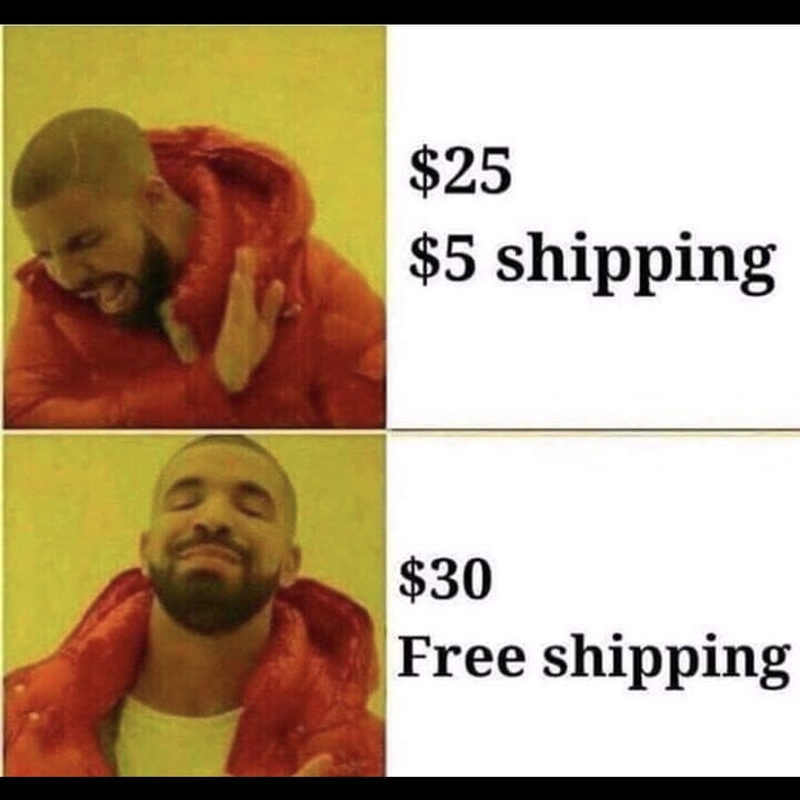 If you cannot afford to offer free shipping and still make a profit, then find a way to make shipping super clear to the customer as they’re adding things to their basket. You might not offer site-wide free shipping, but you may have a threshold whereby is someone spends over a certain amount they get free shipping. How do you expect to sell any products if no one knows you exist? With the right marketing strategy, you can get your product in front of the right people. Want to know one of the most effective ways to market your products? Have someone else do the hard work for you. That’s why it’s super important to generate as many honest reviews and ratings as possible. You also don’t just want reviews about the quality of your products, but the quality of your service too. Reviews are great because people trust reviews much more than the trust any copy on your website. Seen a number of other people all attesting to the same thing. If you do choose to use reviews, try to make them as clear as possible. It’s a bad sign if a potential customer has to hunt around to find the reviews section. Another method of marketing your products is through word-of-mouth. However, in most cases, you can’t force this. If a customer wants to talk about you, they will. However, you can increase the likelihood of them talking about your product by feeding talking points into your loyalty programs. This loyalty program from Dr. Axe offers points in exchange for sharing their content on Facebook and Twitter. If a customer knows they’ll be able to earn points by sharing your content on their social channels within their own network – there is a much stronger incentive. Good old social media. Social media is becoming more and more crucial for eCommerce vendors who want to stand out. With the rise in online social shopping through Instagram and Facebook, consumers often look to social channels to find the next best product they can buy. Here as you’re scrolling through the app, you’re given the option to buy the product directly. We hope this guide has given you food for thought when it comes to your e-Commerce strategy. Perhaps you’re just starting out from scratch and need a comprehensive guide to get started. Or maybe you’re a seasoned eCommerce owner, you may have missed some of the steps here. Use this guide in whatever way works best for you. Let us know your results in the comments, we can’t wait to watch you succeed!